I posted about German regional academic performance back in 2016. The evidence seemed to indicate that German IQ was fairly uniform across Germany, once you took the immigrants out. I stumbled upon a few studies (one done by the German military, when there was still a mandatory draft), that put the regional differences at much higher values than a few IQ points. Basically, there were many regions, where the AVERAGE recruit was in the best/worst 10%, which would dwarf even the black-white-gap. 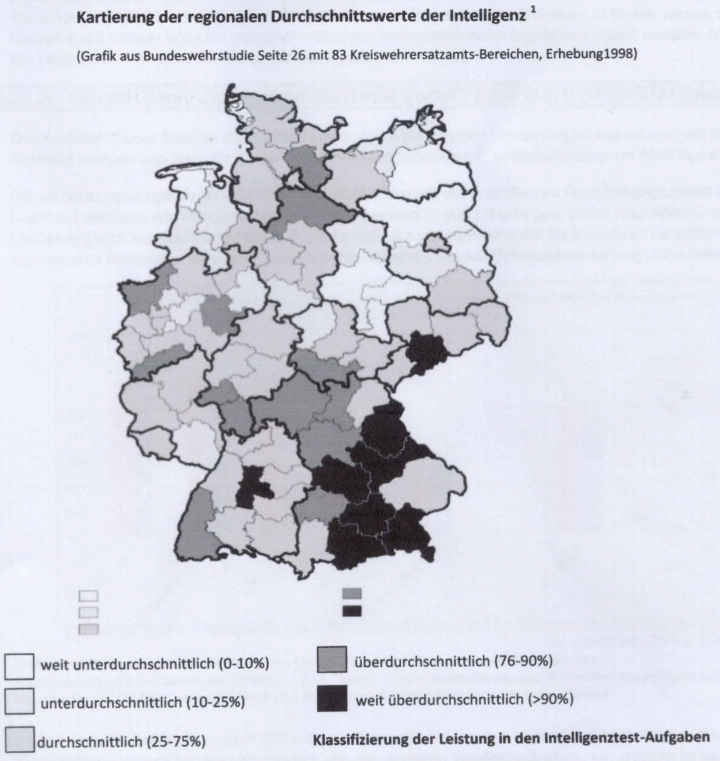 26 Comments to "The Geography of German IQ"
The pdf you linked to states: “the lower the unemployment rate in a region, the higher the general cognitive level”. Basically they claim the unequal intelligence distribution in Germany is due to more intelligent people having left economically depressed regions for regions with better job prospects (e.g. Bavaria)…the obvious example being East Germany which suffered massive population loss to the west before 1961 and then again after reunification in the 1990s. 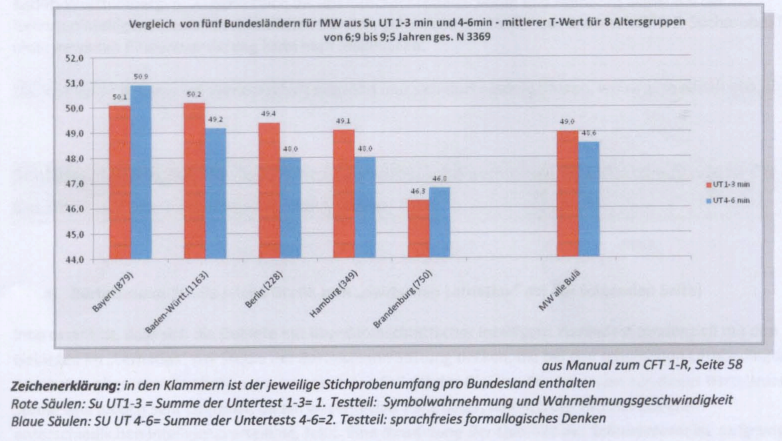 The graphic from the Bertelsmann study apparently is more generally about education systems. Though yes, as Rodolfo says, the magnitude of the difference seems strange. Be in the worst 10% translates to be 1.28 SD below the norm mean. Be in the best 90% translates to be above 1.28 SD. The difference is too huge to be explained by IQ. Someone explain me: if I had a too low score, can I avoid serve the army? This makes sense … brighter people moving to areas with better economic prospects. This might also explain Karlin’s evidence in an earlier posting that the IQs of people in Madrid were higher than the people in Catalonia. London has been described as the center of an empire that colonized the British Isles before colonizing the rest of their empire. One might say the same thing about Spain … and France. Indeed, this is a model for the imperial world. An imperial power tends to concentrate power and wealth at the center with the wealth and power very slowly leaking to the periphery. Ambitious people with ability would, therefore, over time, concentrate in the center. Hence, I would suspect that the IQs in London would be higher than in Manchester and that the IQs in Paris would be higher than in Marseilles. Same for the IQs in La Paz in Bolivia and Lima in Peru compared to outlying Amerindian villages. Race is without question a factor in IQ … but power relations within a culture are also a factor with respect to where people with relatively higher IQs congregate over time. Power evidently attracts people with higher IQs to take advantage of that power and the wealth it can command. You don't have to suspect - higher IQs in capital cities are a common pattern. That said, I am not sure if it will still be true for London or Paris today (especially amongst schoolchildren), thanks to mass immigration. Though they will still retain an outsized percentage of their countries' respective smart fractions. Same for the IQs in La Paz in Bolivia and Lima in Peru compared to outlying Amerindian villages. I take it the District of Columbia is the exception to this thought. $20 Trillion debt, endless no-win wars, destroying their own medical system, etc., etc. This makes sense ... brighter people moving to areas with better economic prospects. This might also explain Karlin's evidence in an earlier posting that the IQs of people in Madrid were higher than the people in Catalonia. London has been described as the center of an empire that colonized the British Isles before colonizing the rest of their empire. One might say the same thing about Spain ... and France. Indeed, this is a model for the imperial world. An imperial power tends to concentrate power and wealth at the center with the wealth and power very slowly leaking to the periphery. Ambitious people with ability would, therefore, over time, concentrate in the center. Race is without question a factor in IQ ... but power relations within a culture are also a factor with respect to where people with relatively higher IQs congregate over time. Power evidently attracts people with higher IQs to take advantage of that power and the wealth it can command. You don’t have to suspect – higher IQs in capital cities are a common pattern. That said, I am not sure if it will still be true for London or Paris today (especially amongst schoolchildren), thanks to mass immigration. Though they will still retain an outsized percentage of their countries’ respective smart fractions. Anatoly, I suspected you would come back with that rejoinder with respect to lower IQ immigrants congregating in London and Paris. Perhaps the next study for London will bifurcate the native and immigrant populations to clearly differentiate the IQs of the servant classes from those of the bankers. Indeed, I recall an earlier blog posting in the Unz Review (was this your's?) that declared that the new immigrants to Germany had already measurably lowered the average IQ in the country. But I digress from my own line of reasoning about higher IQs in capital cities within countries with an imperial power structure. That is clearly not the case in Washington, DC. Anyone with an explanation? The pdf you linked to states: "the lower the unemployment rate in a region, the higher the general cognitive level". Basically they claim the unequal intelligence distribution in Germany is due to more intelligent people having left economically depressed regions for regions with better job prospects (e.g. Bavaria)...the obvious example being East Germany which suffered massive population loss to the west before 1961 and then again after reunification in the 1990s. Indeed, I recall an earlier blog posting in the Unz Review (was this your’s?) that declared that the new immigrants to Germany had already measurably lowered the average IQ in the country. That is clearly not the case in Washington, DC. Anyone with an explanation? Somewhat speculative on my part, but isn't Washington just the political centre of the US? It's not really an economic/financial or intellectual centre like London or Paris have been for a long time, there are other US cities like New York for that. Its population also is much, much smaller than London's or Paris', and iirc for much of its existence it was rather underdeveloped (wasn't much of it basically swampland well into the 19th century? EDIT: - ok, after some googling I've found that seems to be a myth). They are really not that stupid, they just have to play the part in order to get the votes. The reason Washington D.C. has an unimpressive average IQ is of course because of its being 50% Black. "That is clearly not the case in Washington, DC. Anyone with an explanation?" DC has a very large black population. Somewhat speculative on my part, but isn’t Washington just the political centre of the US? It’s not really an economic/financial or intellectual centre like London or Paris have been for a long time, there are other US cities like New York for that. Its population also is much, much smaller than London’s or Paris’, and iirc for much of its existence it was rather underdeveloped (wasn’t much of it basically swampland well into the 19th century? EDIT: – ok, after some googling I’ve found that seems to be a myth). >>>Somewhat speculative on my part, but isn’t Washington just the political centre of the US? It’s not really an economic/financial or intellectual centre like London or Paris have been for a long time, there are other US cities like New York for that. Yeah, but Washington DC is the center of graft (honest graft they would say) of an unprecedented scale. Naturally, lots, and lots of smart people would gravitate there to grab as much as they could. DC produces nothing, but there is so much money sloshing around, the smart just can't resist. Also, many cognitive elites who work in D.C. live in sub/exurbs in MD and VA. There is a reason why several of the top-ten median income counties are D.C. sub/exurbs. While it's true that D.C. has been gentrified with more whites in the recent years, once these people pair up and have children, they move out of D.C. to the surrounding counties and beyond. Loudoun County in VA used to be all farms and horse barns only 15-20 years ago, but now boasts a massive tech/gov/mil industry and the highest median income in the country. Aside from high IQ whites, the region also has a large number of high IQ South and East Asians, who are almost absent within D.C. I might also add that the longest living males in the U.S. are Asians in Fairfax County, VA (the longest living females are Asians in Bergen County, NJ). While it’s true that D.C. has been gentrified with more whites in the recent years, once these people pair up and have children, they move out of D.C. to the surrounding counties and beyond. Loudoun County in VA used to be all farms and horse barns only 15-20 years ago, but now boasts a massive tech/gov/mil industry and the highest median income in the country. Aside from high IQ whites, the region also has a large number of high IQ South and East Asians, who are almost absent within D.C.
Great analysis of DC area. I'd just quibble that a disproportionate number of the freak white people who live in DC end up never having any children, so schools or the "need" for a big house are not a factor motivating the majority of them to leave DC for MD or NoVa. Also, I think that not only several, but a MAJORITY of the ten highest median-income counties in the USA are in Virginia and Maryland, because of their proximity to our Imperial City. or better access to information. that will change if you import lots of lower iq non-Europeans over time. if I read right in Germany, the higher score regions are more conservative/nationalist. my understanding is that Southeast is Catholic majority and NorthEast is more secular, but both are more European white? my understanding is that Southeast is Catholic majority and NorthEast is more secular, but both are more European white? East Germany in general is secular, the GDR did a thorough job of de-Christianizing the people there. Much fewer migrants and their descendants there than in West Germany...but the North-East (Brandenburg, Mecklenburg-Vorpommern) has few people in general, much of it is very rural...I can believe that on average people there are pretty dumb, the more intelligent people have been fleeing the region for the last 25 years. Bavaria is mostly Catholic (with some Protestants though in Franconia), but of course it's increasingly secularized as well. Quite a lot of migrants there, with percentages among children in many towns and cities I regard as rather shocking...but on the whole right now it works much better than dysfunctional states like North-Rhine-Westphalia with its badly integrated Turks. East Germany in general is secular, the GDR did a thorough job of de-Christianizing the people there. Much fewer migrants and their descendants there than in West Germany…but the North-East (Brandenburg, Mecklenburg-Vorpommern) has few people in general, much of it is very rural…I can believe that on average people there are pretty dumb, the more intelligent people have been fleeing the region for the last 25 years. Bavaria is mostly Catholic (with some Protestants though in Franconia), but of course it’s increasingly secularized as well. Quite a lot of migrants there, with percentages among children in many towns and cities I regard as rather shocking…but on the whole right now it works much better than dysfunctional states like North-Rhine-Westphalia with its badly integrated Turks. People in the former West Germany seem pretty darn secular, too. We socialize with Germans and recently immigrated German-Americans all the time, and almost nobody we know or ever meet who is from Germany -- any part of Germany -- attends church or is involved with religion, "organized" or otherwise, in any regular or meaningful way. Well before the Muslim population approaches parity with the German population in Germany (and other European countries), there will be more active mosques than active churches. Terrifying prospect. Since 1990, the former East Germany has received more than €2trn from the old West Germany, for a fast-ageing, shrinking and disproportionately male population of only 16 million, including Berlin. That’s the equivalent of a Greek bailout every year since 1990, and as a straight gift, not a loan. This represents a huge shift in financial priorities, overshadowing Germany’s annual net EU budget contribution (currently €15.5bn). In 1990, Kohl promised that western German aid would soon turn the new states into “blooming” areas, but they have become, instead, proof that age-old differences resist even the most gigantic subsidies. According to the late Robert Gayre, “the Elbe is a pronounced ethnographic frontier “. "So while it is easy and comfortable to say that the otherness of eastern Germany today is the result of that 40-year Soviet occupation, history says otherwise. East Elbia has always been different. Take the voting patterns: from 1871 to 1933, East Elbia outside Berlin (always a left-liberal political island) was the main electoral reservoir for the authoritarian right. The Prussian Conservative Party under the empire, the Deutschnationale Volkspartei until 1928 and the Nazis from 1930 depended on rural and small-town East Elbian voters. It was they who (just) swung things in 1933, by going 50-60 per cent for the “Hitler coalition”. Had all Germany voted like the Rhineland or Bavaria, Hitler and his Junker allies would have got nowhere close to a majority. Small wonder that Adenauer didn’t want East Elbia back and was secretly delighted to have it safely fenced off behind the Iron Curtain." it did during my last visit. No wonder Nietzsche detested Prussia. spirit, joie de vivre if you will which I associate with Catholicism. in the late 800s-early 900s. OT: could you give anecdotal observations of the effect of Merkel's Million Moslem March upon the places you visit in Germany, before/after? There seems to be a pretty clear positive correlation between the higher IQ / better learning environment areas and and vote percentage for the oh-so-populist-if-not-outright-neo-Nazi AfD party (according to the Cathedral, that is) in last Sunday’s general election. Qualification: The correlation applies separately for each of what used to be West and East Germany. 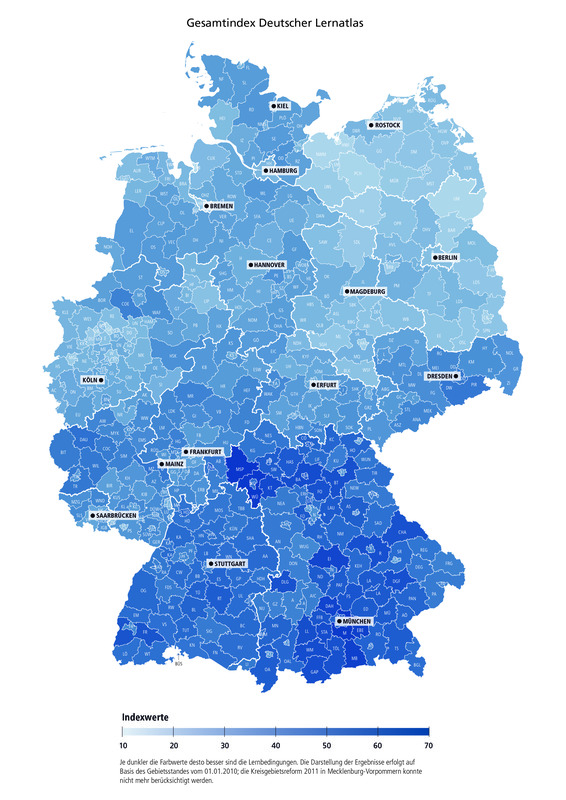 Even in the lower IQ areas of the East the AfD vote share was higher than in the higher IQ areas of the West. So, while IQ is not the only factor, statistically it seems to be a quite important one in determining relative AfD affinity. This flies in the face of the commonplace assumption that the AfD is the party of stupid loser populations. We had to end a nice acquaintanceship with a German-American woman who "informed" us that "everyone with those people [AfD] is an uneducated racist idiot, they are all the stupid backwards people of Germany" -- and then insisted on repeating the claim, angrily, even after we explained that "well, one of our very close family friends is a German who supports the AfD, and she is a brilliant, thoughtful, and kind woman." The wench even refused the invitation to exclude our personal friend from the characterization as "stupid." That's how hysterically irrational and rude these self-hating lefties are, and the Germans are the worst I've ever encountered. Eine Schande, my people have become. OT: could you give anecdotal observations of the effect of Merkel’s Million Moslem March upon the places you visit in Germany, before/after? DC produces nothing, but there is so much money sloshing around, the smart just can’t resist. According to the late Robert Gayre, "the Elbe is a pronounced ethnographic frontier ". It should never, ever be forgotten, that Hitler and his cronies were not elected in anything resembling a democratic vote. There are, however, obvious, if inacceptable, reasons for arguing as if that were the case. Great analysis of DC area. I’d just quibble that a disproportionate number of the freak white people who live in DC end up never having any children, so schools or the “need” for a big house are not a factor motivating the majority of them to leave DC for MD or NoVa. People in the former West Germany seem pretty darn secular, too. We socialize with Germans and recently immigrated German-Americans all the time, and almost nobody we know or ever meet who is from Germany — any part of Germany — attends church or is involved with religion, “organized” or otherwise, in any regular or meaningful way. There seems to be a pretty clear positive correlation between the higher IQ / better learning environment areas and and vote percentage for the oh-so-populist-if-not-outright-neo-Nazi AfD party (according to the Cathedral, that is) in last Sunday's general election. The wench even refused the invitation to exclude our personal friend from the characterization as “stupid.” That’s how hysterically irrational and rude these self-hating lefties are, and the Germans are the worst I’ve ever encountered. Eine Schande, my people have become. Presumably, these 10% and 90% etc. figures refer to the regional rankings, not the mean of the individual rankings at state level. Very different because the regional SD is much lower. E.g. 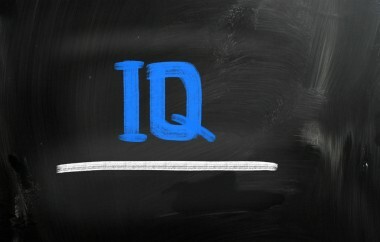 for US states, the IQ SD is 2.7 or so, so being the 90th centile state entails a mean IQ of approx. 100 + 1.28 * 2.7 i.e. IQ 103.5.